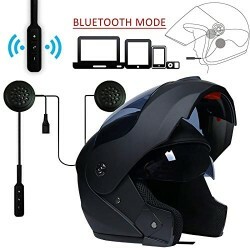 WingSport Motorcycle Helmet Intercom Bluetooth Headset is a Bluetooth Headset designed for the motorcycle rider and passenger who wish to have clear and reliable wireless communications while riding. (1)Wireless headset for Bluetooth enable cell phone at a range of up to 10 meters. 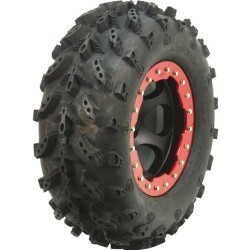 Two separate riders intercom, the maximum distance can reach 800-1000 meters. 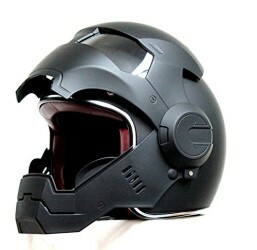 (2) This headset is compatible with Bluetooth cellular phones and can be suited to any Full-face Helmet and most Half-face Helmets. (3)Easily call or answer the call, reject the call or hang up, redial the last call and answer the call automatically. (4)Support for audio transmission. The 2.5mm audio cable can be connected this intercom to a cell phone, tablet, GPS or other device to transfer music/voice to the headset. (6)Enjoy the cell phone music through A2DP or connect GPS. (7)Control cell phone music through AVRCP: forward, backward, play,pause. (8)Automatic switching among Bluetooth cell phone, intercom, stereo music. (9)With DSP echo cancellation and noise suppression technology, crystal clear voice quality is guaranteed in a high speed. 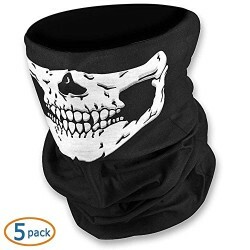 (10)Button panel is water-proof and sun-proof, while the design is durable. ●Warranty Period: One year. If you have any questions,please contact us as soon as possible, we are glad to serve you. 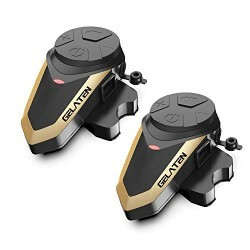 ●Full-Duplex: Direct Full-Duplex intercom for Dual-Bluetooth helmet headsets with up to 80km / h and a maximum distance of 800-1000m, supporting 3 rider pairings and 2 rider intercoms simultaneously,providing clear and reliable communication. ●Noise Reduction Technology: DSP echo cancellation and noise suppression technology ensures clear voice quality at high speed. making your driving journey more exciting. 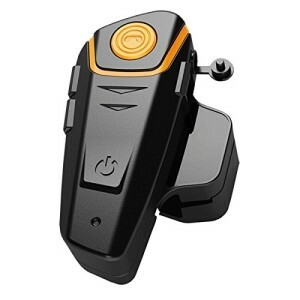 ●Bluetooth hands-free:Easily call out or call answer , reject the call or hang up. Receive a cell phone call automatically and support the last number redialing. ●2.5mm Audio Socket: This motorcycle intercom can be combined with your cell phone, MP3 and GPS via the 2.5 audio cable (included). 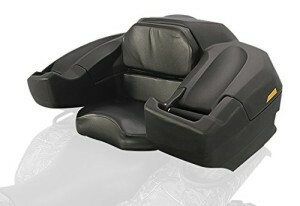 Even if the intercom does not have enough power, it can play music and GPS without any influence. ●Excellent Waterproof: It is waterproof with All-Silicone, even if it is rainy or snowy, it will not affect the use, no need to worry about the weather, make your outdoor riding more exciting.